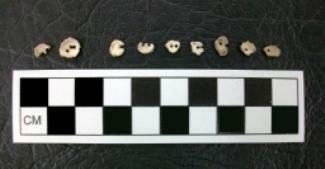 As the world’s leading authority on beads manufactured from shell by California’s Chumash Indians, UCLA archaeologist Jeanne Arnold was stumped by a series of anomalous artifacts excavated at former settlements on the Channel Islands. Pierced with more than one hole, often at unconventional angles or too close to the edges, the oddly-configured multi-hole beads differ considerably from the smooth, round, precisely drilled beauties that served as currency among Chumash prior to the arrival of Europeans. “Originally, I thought these were new, experimental forms executed by virtuoso bead makers,” confessed Arnold, a researcher at UCLA’s Cotsen Institute of Archaeology and UCLA professor of anthropology. On closer analysis, however, she now believes the shell artifacts that are nearly 250 years old provide a rare window into a little known world: the efforts of young apprentices, possibly children, among traditional peoples. “Very likely, Chumash apprentices were learning to make money from their parents and these were their practice pieces,” she said. Arnold spells out her theories online in the Journal of Archaeological Method and Theory. The issue is expected to go online May 10. ? ?DATE TO COME. The rugged Channel Islands located 60 miles west of Malibu were home to more than 3,000 Chumash people who operated North America’s largest and most spectacular shell-working enterprise. Santa Cruz Island, which has an abundant outcropping of flint suitable for drilling tools, served as the center of these activities, which date back more than1000 years. Islanders made shell ornaments, decorative beads and pendants, and most intensively of all, shell beads that prior to the arrival of Europeans served as currency. The group’s monopoly on currency-making made the islands into the ‘mint’ for Chumash transactions in central and southern California, Arnold said. Chumash-made beads have been found as far away as northern Nevada and the Four Corners area of the Southwest. In the past 15 years, archaeology crews working under Arnold’s supervision have unearthed roughly 320 unconventional shell beads amid thousands of standard beads at the sites of two former villages on Santa Cruz’s coast. Previously dismissed either as mistakes or attempts at innovations by journeymen bead-makers, these tiny white beads actually reflect a range of production errors at the hands of novices, Arnold argues. To make beads, the Chumash split spiral-shaped Olivella biplicata shells into three or four fragments, Arnold said. Olivella is a small sea snail found on sandy beaches. Bead-makers then chipped the fragments into round shapes with stone. Using flint tools at first but later metal needles, they drilled the beads and strung them on twigs in batches. Finally, bead-makers smoothed the perimeters by grinding the strung batches on an abrasive slab of sandstone. Most of the anomalous artifacts have two holes, but several have unprecedented third holes. The multiple holes appear to have been drilled after initial mistakes doomed the bead to failure for display or stringing. In addition to odd piercings, the beads in the study rarely feature ground perimeters. Arnold believes the unfinished state adds credence to the idea that the artifacts served as practice slates. “It’s as though parents didn’t want to let children or novices learning the craft waste the chipped shell fragments, so they had them practice making holes over and over again in the same shell,” she said. The anomalies were excavated in areas where archaeological research has determined that Chumash lived in thatch-covered round houses. Because the light would have been too weak for the work inside the window-less dwellings, adults are believed to have produced the quarter-inch wide beads just outside the huts. Arnold believes that the child-rearing would have occurred along side bead-production, offering an opportunity for youth to imitate their parents as they crafted the objects from the shells. “Either through play or imitation children would make these beads… and eventually come to be taken seriously as a novice bead worker,” she said. Among the few other cases of craft apprenticeship detected in the global archaeological record are tools made by children during the late Stone Age in the general area of today’s Paris, France and pots and tiny figurines made by novices learning basic ceramic skills about 800-1000 years ago in Southwest pueblos.